As we close out a monumental first half of the school year, I’d like to take a moment to thank you once again for your support of our students and schools this past November during our District’s Bond Election. Your overwhelming support will allow us to aggressively pursue Round Rock ISD’s strategic goals, provide equity across our District, enhance safety and security, and build for the impressive growth we continue to experience. Throughout the Bond project process, it will be a priority to keep you, our community, informed and updated on our progress. Currently, our Operations Department is in the process of soliciting design firms for the C.D Fulkes Middle School, Elementary #35, Early College High School and Aquatic Center projects and planning for several safety and security and capital renewal projects to begin this spring and summer. Our planning processes include following intensive acquisition procedures that are required by law for project designs, goods and services and permitting, which will be followed by installation, implementation or construction. This spring, you will see projects related to safety and security roll out and continue into the summer months. These priority projects include the installation of surveillance cameras for portable classrooms, installation of a video intercom system at the front entrance of campuses and upgrades to our visitor management system, which is utilized at each school. The summer is expected to bring much-needed updates to several campuses, including HVAC system improvements at Fern Bluff, Anderson Mill and Berkman elementary schools and Hernandez Middle School, and playground upgrades at Anderson Mill, Canyon Creek, Forest Creek, Brushy Creek, and Bluebonnet elementary schools. Parking lot improvements for Spicewood, Fern Bluff, Forest North, Purple Sage, and Bluebonnet elementary schools and Grisham Middle School will also take place during this time. In 2019, we will also begin the design and planning process for the Westwood High School Master Plan Phase 4a and 4b and McNeil High School Master Plan Phase 2a projects. Construction funded by Bond 2014 is ongoing at McNeil, with a major project coming to completion over the next few weeks. The new special education wing, located on the front west corner of the school, will be ready for students when we return from winter break in January. We will continue to reach out with updates on our Bond project progress throughout 2019. These efforts will begin with refreshing our current Bond website, with updated information and to reflect project progress. We plan to have new information on the website in January and will provide District-wide communication as soon as it is updated. We will also continue to use the District’s main website, news website, email communication, monthly eNews, Facebook, Twitter and Youtube channels throughout the year to share information with you. 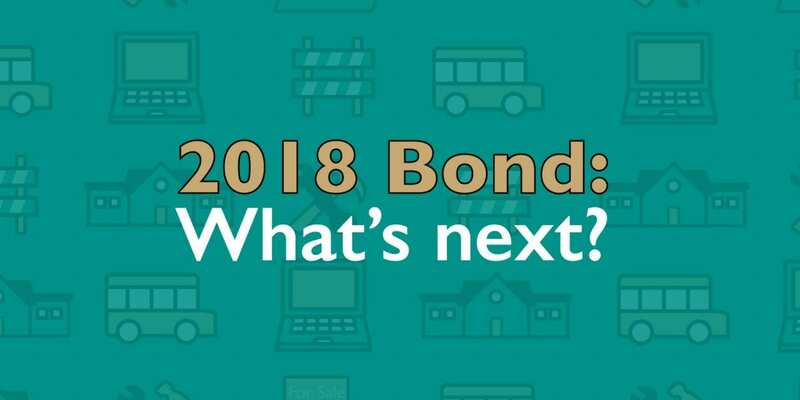 I encourage you to stay connected to all of these resources as we work diligently to provide you with the latest updates regarding Bond projects. This is only the beginning of a bright future for Round Rock ISD, and I thank you in advance for your support of our students and schools. I hope you all enjoy the holiday season and wish you the best for the new year.